July 17, 2011 October 21, 2013 / Edmund Waldstein, O.Cist. Yesterday I was in Vienna for the funeral of His Imperial and Royal Highness, Archduke Otto of Austria, Royal Prince of Hungary etc., eldest son and rightful heir of Bl. 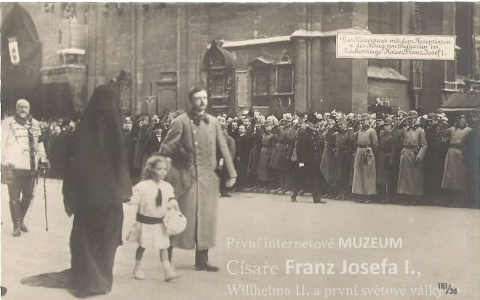 Charles of Austria, the last Emperor of Austria and Apostolic King of Hungary. One of the the most striking things about the solemn and elaborate ceremony was how joyful it was. From whence came that joy? 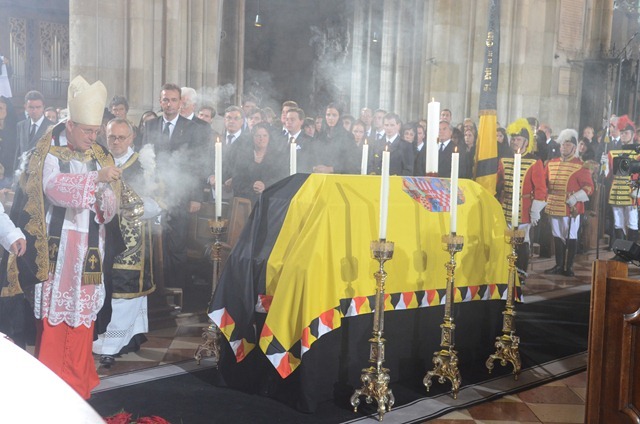 What could be more calculated to plunge us once again into all the piled-up sadness of the 20th century – that most ruinous of all periods in the history of Central Europe – than the funeral of the head of the House of Austria who lived through practically all of it? 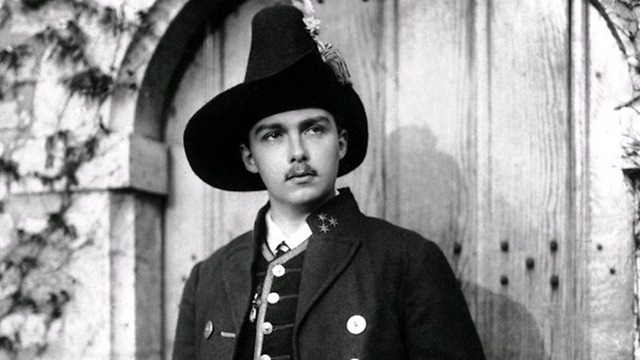 Otto von Habsburg was still a child when the the World War shattered the “clay pot” of Austria-Hungary into dozens of unstable fragments, but he was then quite an active behind-the-scenes player in the following decades which saw the Anschluss, the Second World War, the establishment of Marxist dictatorships in almost all of the former crown lands, and the astonishing spiritual and moral decline of the West. The Benedictus antiphon that we sing on the Feast of Bl. Charles of Austria is taken from Matthew: “Similabo eum viro sapienti qui aedificavit domum suam super petram: I will liken him unto a wise man, which built his house upon a rock.” (Mt 7,24) Bl. Charles built his whole life and the life of his family upon Christ, and Otto certainly attempted to follow him in that. But doesn’t it seem that Christ did not turn out to be a rock for them at all? After all, pretty much everything that could go wrong for them and the their peoples did. Otto received truly great talents; probably the greatest political talents of any head of the House of Austria since the Empress Maria-Theresia, but it seems that they were wasted. What might he not have done had he been emperor? I raised those questions in my sermon this morning, and tried to find an answer in today’s Gospel, the Gospel of the wheat and tares. For these are questions which we can ask (on a much smaller scale) about our own lives: why does it seem that even though we try to build our houses on Christ the rock, the Kingdom doesn’t seem to show up. Why is it that Christ allows so much of out work to come to naught? Why does He let so much wickedness and mischief to get in the way of those who are trying to serve His Kingdom? “Wilt thou that we go and gather it up?” say the workers of the tares, “And he said: No, lest perhaps gathering up the tares, you root up the wheat also together with it.” Why is it that gathering up the tares would uproot also the wheat? Perhaps it is because the tares and wheat are mixed even in our own hearts. We have two principles of life in us: the Divine life which grows in us through grace, and our “natural” earthly life. Our earthly life is of course not bad in itself, just as weeds are not of themselves “bad” plants, but because of the disorder of sin it stands in competition to the little plant of eternal life growing within us. The paradox is that the suffering, humiliation, and frustration that are caused in us from without – in other words just the sort of things which tend to think of as weeds that Christ ought to uproot, are precisely what Christ uses to pull out the weeds in our own hearts. When we go to our Creator we will be judged only on whether we did our duty and set our will on the good. God does not demand that we bring him victories. 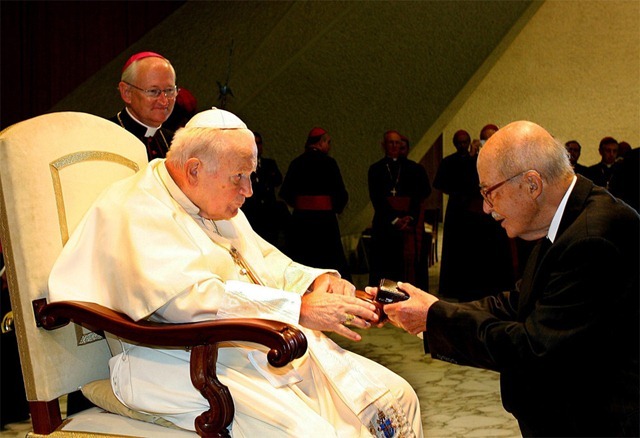 He understood the heritage of his family as a mission and a vocation. He was not nostalgic for the past, but neither did he let let himself be swayed by those who wish to belittle it and see only its shadows. […] Humility is the gift of the truly great, who know themselves to be small before God, and therefore look down on no one. 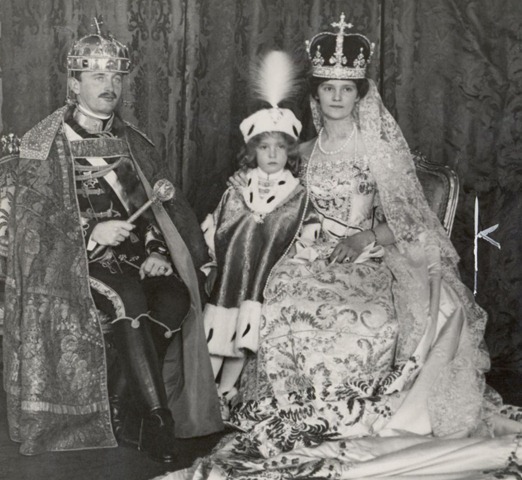 Countless people noticed that gift in Otto von Habsburg: no trace of snobbishness, but a “modest pride” in being the heir of the house of Habsburg. MC: Otto of Austria; once Crown Prince of Austria-Hungary; Royal Prince of Hungary and Bohemia, of Dalmatia, Croatia, Slavonia, Galicia, Lodomeria and Illyria; Grand Duke of Tuscany and Cracow; Duke of Lorraine, Salzburg, Styria, Carinthia, Carniola and the Bukowina; Grand Prince of Transylvania, Margrave of Moravia; Duke of Upper and Lower Silesia, of Modena, Parma, Piacenza, Guastalla, of Oświęcim and Zator, Teschen, Friaul, Dubrovnik and Zadar; Princely Count of Habsburg and Tyrol, of Kyburg, Gorizia and Gradisca; Prince of Trent and Brixen; Margrave of Upper and Lower Lusatia and Istria; Count of Hohenems, Feldkirch, Bregenz, Sonnenburg etc. ; Lord of Trieste, Kotor and Windic March, Grand Voivod of the Voivodeship of Serbia etc. etc. Prior: We do not know him. 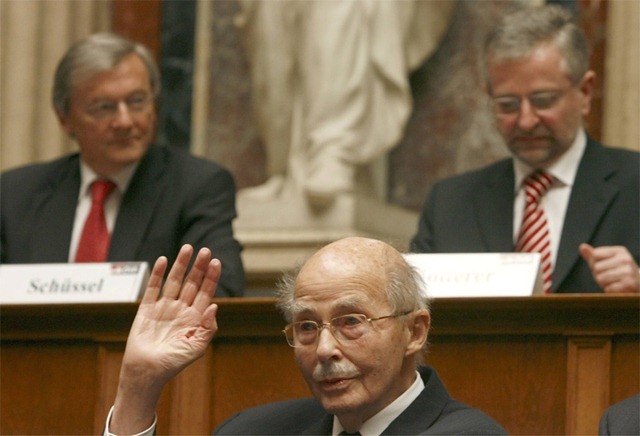 MC: Dr. Otto von Habsburg, President and Honorary President of the Paneuropean Union, Member and quondam President of the European Parliament, honorary doctor of many universities, honorary citizen of many cities in Central Europe, member of numerous venerable academies and institutes, recipient of high civil and ecclesiastical honors, awards, and medals, which were given him in recognition of his decades-long struggle for the freedom of peoples for justice and right. MC: Otto, a mortal and sinfull man. Prior: Then let him come in. History……ever present, always mindful……causes tear drops to fall. May he finally rest in peace. “Cardinal Schönborn spoke of Otto’s tireless work for the fall of Nazism and Comunism as being Otto’s vocation as the head of the House of Austria, WHOSE TRAGIC DECLARATION OF WAR ON SERBIA set the events in motion which were to lead to the rise of those terrible tyrannies”: this is a very simplistic way of telling History! Who did set the things in motion which were the cause of that DECLARATION of WAR??? And TO WHICH PURPOSE was it brought about??? It’s very boring to listen to the same correct account, the ‘same’ because politically correctness impose it! Was Archduke Otto conscious of the True History? I don’t think so! Was he, at least, in good faith??? I hope for him! Yeah, obviously there were other interests at work in the build-up to WWI, as Archduke Otto was most certainly aware. Archduchess Gabriela said the following in a recent interview: “Ich glaube nicht, dass man der Geschichte gerecht wird, wenn man sagt, dass die Habsburger die Schuldigen waren am Ersten Weltkrieg.” Translation: “I don’t think that one has come to a just view of history if one says that the Habsburgs were at fault for the First World War.” Nevertheless, the harsh ultimatum to Serbia and the inevitable declaration of war which followed it were tragic in that the played into the hands of sinister forces. That’s all I’m saying; I’m not saying the House of Austria is alone responsible for the entire war and all it’s remote effects. This is a valuable reflection on the passing of a great man. «Initium enim recedendi a Deo fastidium doctrinae est.» Palladius, Historia Lausiaca. gregorystackpole on Sancrucensis in the U.S.